Bravo confirms Courtney Loves Dallas for Fall lineup. Sort of. UPDATE (10/21/13) Bravo has just confirmed that Courtney Loves Dallas will launch Thursday, December 5, 2013. To read my exclusive interview with Courtney Kerr click here. 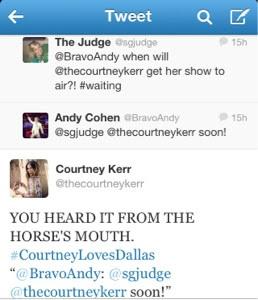 Bravo's Andy Cohen confirmed on Twitter Friday that "Courtney Loves Dallas" staring our own Courtney Kerr will air... "soon". Originally, this new doc-series was slated for Spring 2013, then it got pushed to Summer and now we have our fingers crossed for a Fall debut. In the summer of 2011 Bravo tried a new show format called Most Eligible: Dallas. The plan was to launch the concept in multiple cities - Chicago and the New York City and so on. Alas, the show was not well received and the whole concept was scrapped. What Bravo did love was the big-haired, big mouth Courtney Kerr and they decided to develop a spin-off around her. The premiss? "Breakout star Courtney Kerr of “Most Eligible Dallas” navigates the lively Dallas social scene with her group of sassy, dynamic friends in this docu-series", said a Bravo press release. "Juggling her search for the perfect southern gentleman while trying to make a name for herself in the fashion industry with the growing popularity of her fashion blog, Courtney proves that having it all isn't easy." Kerr told me that the show will follow her journey as she quits her long-time job at Sunglass Hut as a Regional Manager, moves into a new apartment, seeks to launch a career as a fashion blogger and - oh yes - looks for love in Big D. Helping her navigate her way through life in Dallas will be besties Tori Gonzales and Daylon Pereira.